Enjoy your favorite beats on-the-go and touch off impromptu dance parties with Boombot Rex. Grab it at Grand St. (in Pitch Black for $108 or Limited Edition Brushed Aluminum color for $117) after you apply the 10% discount code '10offREX' at signup. 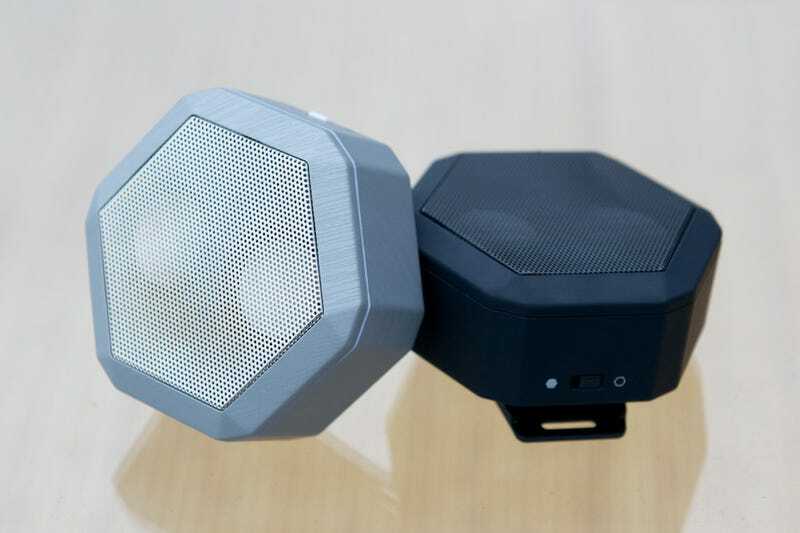 This portable Bluetooth speaker packs a lot of punch for such a small, lightweight container. Dual 36mm drivers and a bass woofer deliver rich, dynamic, high-quality sound. Easy-to-grip, high-impact ABS plastic exterior lets you take that sound quality anywhere without worry. This throw-in-your-backpack device requires no special treatment (it can withstand drops of up to 2.5 meters). The battery takes just one hour to charge and delivers up to six hours of tunes. If you want to create a surround sound effect with more than one Rex, Boombot is currently letting users sign up to alpha test their synchronization app. The Rex allows for full wireless control via any smartphone, tablet, or computer. Small buttons on the speaker allow you to control your music (track control and volume) without having to pull out your phone. This little speaker also contains a noise-cancelling mic, so you can answer calls with the press of a button.